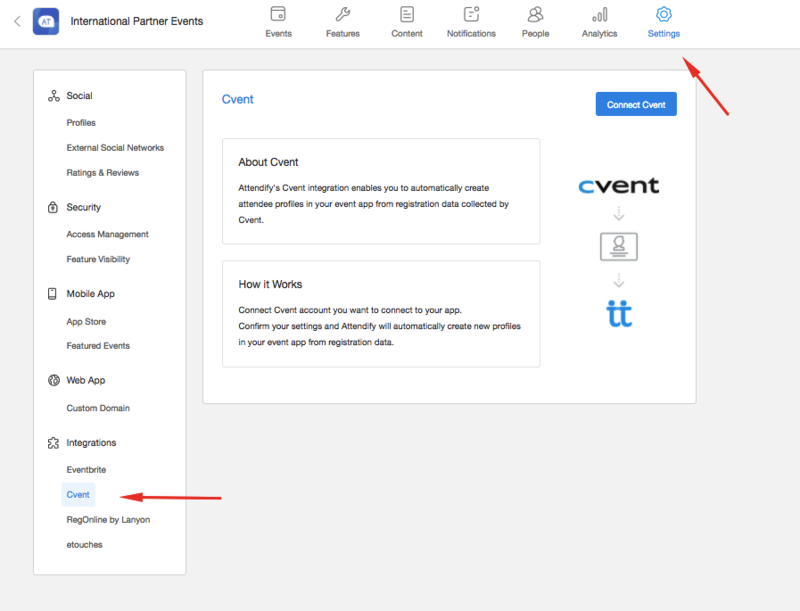 The first integration is our in-house registration platform that connects seamlessly with our event apps for a smooth experience. You can learn more about how to connect them and bring attendees into your app here. 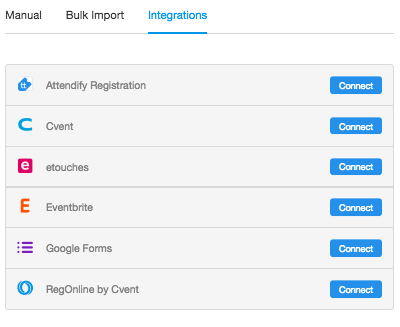 The remaining integrations are outside services used to help you automatically create attendee profiles in your event app from registration data you collected through one of those services. The integration with Salesforce enables you to automatically transfer attendee profiles outside the app to your Salesforce account and create new leads. Log into the management dashboard and open the Settings section. In the lower-left area of the screen go to the Integrations section and pick the services you'd like to connect. Check the section "How it works" for instructions and click the button "Connect" to enable the integration. NOTE: Integrations should be enabled at the container level (not at the level of a separate event). After the integration has been enabled, every 30 minutes your app retrieves new attendees that have registered through the connected service. The email address is used as a unique identifier of each account created in the app. If someone changes his/her email address through the linked service, the app will create another account under the new email address, while the old account will stay in the app as well. If any additional profile's info other than the email address is updated by an attendee via the connected service (e.g. first/last name/company/position/etc) it will not be updated in the app. The integration allows only to push the profile info into the system on the initial sync. Any further updates to the profile info would need to be done manually. In case someone deletes his/her account on the integrated service, it will still stay in the app. Once the integration is activated, all newly created profiles are automatically transferred to your Salesforce account and added as leads - those profiles that had existed in your app before the integration was activated aren't transferred. Attendify transfers profiles regardless of their presence in Salesforce. In case a lead with the same email address already exists in Salesforce, a duplicate profile will be created. If an attendee updates profile information after profile's data was transferred, this update will not be reflected in Salesforce. Select the Add button for Google Forms. To add the Google Forms integration click the view responses button in Google Forms interface. Then go to file> “Publish to the Web”. Select the From Response 1 instead of the entire document. Select the comma-separated values (.csv) instead of Web. Copy the link then paste it in the Google Form integration field. This is all there is to integrations! If you have any additional questions, feel free to contact us at support@attendify.com.